Falcon Electrical Doncaster offer a significant choice of design and installation options for external lighting for gardens, houses or general security. Lighting for outside your home can be achieved in many ways, LED Up-lighters, Lamp Post Lights, Low level lighting or even simple flood lights with movement detectors for additional security. The installation of any external lighting must be handled carefully and correctly, as cabling, joints, and fittings are exposed to the elements every day of they year. Some cables that must run underground must be armoured to protect against a variety of potential incidents such as a garden spade cutting through a live cable, which could be a very serious injury. We offer free consultation, design ideas and transparent pricing for your piece of mind. Up-lighting, as illustrated in the image above, can transform the look of your home from great to truly fantastic. Colour changing LED garden or general external lighting can offer an exciting option over the traditional white. Different tones, lighting levels can deliver a low lighting mood, or a very bright modernistic look, both of which can be programmable and timed to come on when you choose. Simple wall lighting can transform an unnoticed collection of dark brick steps into a garden feature point, creating the option of spending many more hours in your garden after the sun has disappeared. Falcon Electrical have years of specialist external lighting design and installation experience in Doncaster and around the South Yorkshire regions, we can help transform your home or into something truly unique. 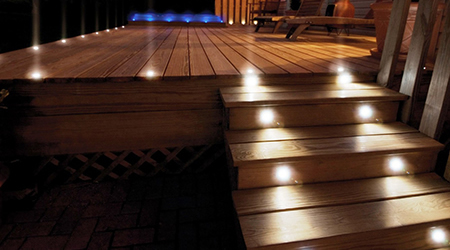 External lighting for Timber Decking is becoming increasingly popular, let Falcon Electrical create something truly imaginative and Mediterranean in your back garden! Creating an even spread of lighting, or placing a focus wherever you may choose, must be planned out carefully to achieve exactly the right balance between focus and general.Too much lighting will create the wrong mood; too little and it will be too dark. Falcon Electrical are Doncaster's premier experts for all external lighting, we offer 100% free consultation, Design and Estimates, call now for more information or to organise your appointment.